"Hal Bruce brought the house down with his incredible performance at the CIOE Concert Hall on March 24th. He showed why he is in three Music Halls of Fame. Hal is the consummate performer - a great voice - a great musician - and a great story teller with a unique ability to totally engage his audience leaving them begging for more. Hal's star quality and on-stage performance is even further enhanced by his lovely and charismatic wife Lynne. We will have him back again and again and again." "It is always a pleasure to have Hal provide the entertainment at our corporate events. 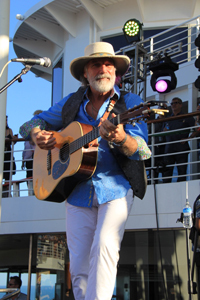 He is a class act who engages the audience with his superb voice and skilled guitar playing. Hal plays to the audience and can easily adapt between songs from days gone by and todays music. Hal’s pride in his craft is evident in his performance. Always a pleasure!" "Hal has performed at the Marigold Cultural Centre Theater in Truro Nova Scotia for 2 years in a row. His show sells well and has always been well received by the audience. The audience enjoys his video presentation and likes to reminisce and sing along with Hal as well as look forward to hearing new pieces he has written." "Hal Bruce is the most Professional Musician I have ever had the pleasure to meet, and his playing and singing is second-to-none! As an individual entertainer, he has a huge following in America, Canada, Europe, and (of course) Liverpool. He missed one year at International Beatle Week in our city and the Cavern Club management was inundated with complaints. He returned this year to packed out venuesHe sure knows how to engage an audience!" "I am proud to be associated with, and a friend of many years, appearing at the world-famous BeatleWeek celebrations. I'd like to thank Hal for all of the great work he's done promoting the music of The Beatles and for allowing me to play him on my radio show." 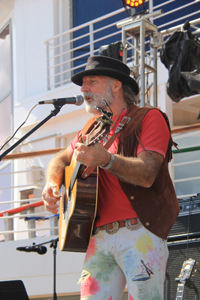 "Hal Bruce is a true professional and performer, both on and off stage. His spot on take of the classics of the 1960s and 70s and of The Beatles is second-to-none, and it's no wonder that he sells out at our theater every single time he visits." What struck me about Hal Bruce, apart from his utter professionalism and talent as a singer and performer, is his natural ability and willingness to share his secrets and knowledge of his trade with other musicians/singers. He is the "Human Jukebox!" We have shared many stages together, England, Belgium, USA, Canada, and on". I've known Hal for over 30 years. If it's an interview, performance, or talking with fans, he is a professional who is prepped, ready and on time, always! "Do you want to know a secret? Hal Bruce is the world's best solo Beatles performer, who knows every Beatles song by heart! and with no song book in front of him...and able to play any one of them upon request!" "Hal Bruce is The 'Cavern's Very Best Friend! Need I say more?" "Hal Bruce has been a mainstay at our musical event for nearly 20 years. His vast musical repertoire, his professionalism and his ability to connect with an audience is second to none. I couldn't recommend Hal Bruce highly enough for any event!" "Hal has always been a Pro! Always a gentleman and always a pleasure to be around; he is both dedicated, heart and soul, to his friends and his music!" "I have performed and recorded with Hal Bruce, internationally, and I can't say enough about his professionalism and attention to detail. Also a fine human being and superb entertainer!"